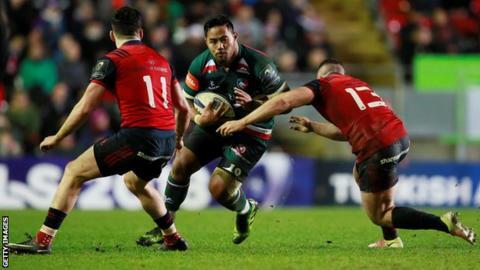 Munster maintained their unbeaten Champions Cup run and dealt Leicester's qualifying hopes a huge blow by beating them for the second time in nine days. The Tigers, beaten 33-10 at Thomond Park last weekend, made a good start at Welford Road with Matthew Tait's try. But Ian Keatley capitalised on the home side's indiscipline, kicking six penalties in total as Munster extended their lead at the top of Pool Four. Leicester are bottom, nine points off the automatic qualifying spot. Munster, who picked up three wins and a draw from their first two games, are four points ahead of nearest rivals Racing 92. Leicester next face a trip to Castres, with a home tie against Racing 92 to follow, and will have to rely on a miracle to qualify for the quarter-finals. Despite witnessing a closer affair than in Ireland, head coach Matt O'Connor was left to rue his players' first-half penalty count. Leicester conceded 10 penalties before the break, five of which were given away by experienced prop Dan Cole. The England international was eventually sent to the sin-bin just before half-time and his side, having built up a good lead, shed 10 points in his absence. The Tigers had made a promising start through full-back Matthew Tait who, in for the injured Telusa Veainu, darted his way through the Munster line. But they played the rest of the half in the wrong area of the field and with referee Mathieu Raynal keen to give the advantage to the attacking side, Tigers fell behind as fly-half Keatley punished their errors at the breakdown. Keatley gave the visitors into a narrow half-time lead before Ireland number eight CJ Stander barged over after Conor Murray's initial break. But with Munster seemingly in control, George Ford knocked over two penalties of his own before John Ryan was sent to the sin-bin for a cynical foul at the breakdown. Down to 14 men, the Irish side conceded just three points compared to the 10 shed by Leicester earlier in the game, and with Ryan back on the field, Keatley extended their lead from the tee. Leicester were denied even a losing bonus point when Keatley stretched Munster's lead out to nine points as Leicester conceded their 14th penalty of the afternoon.